The Witcher 3: Wild Hunt is an open world role playing game set in the Northern Kingdoms. It is the last game in the series and continues Geralt of Rivia‘s story as he embarks on a personal mission. It is to be released on May 19th worldwide. 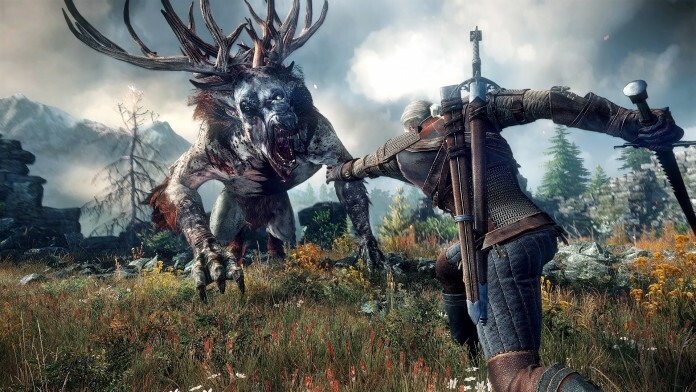 The Witcher 3: Wild Hunt will be the largest Witcher game to date. It has been reported that the game world size will be thirty times larger than the Witcher 2: Assassin of King’s game world, and will also be larger than Skyrim’s size, which is the game that The Witcher 3: Wild Hunt intends to knock off of it’s perch as best RPG ever. The gorgeous world isn’t empty either, with different enemies attacking depending where you are, and random events being plentiful. We saw on a gameplay trailer for it that when on a hunt for a griffin, Geralt came across a merchant woman being harassed, who he then promptly saved. It was then revealed that if we go back to the person after we killed the griffin we could then receive a reward. The large, beautiful world with things to do is certainly an improvement from passed Witcher games, which had smaller, separate maps and sometimes not much to do in either. Past Witcher games were sometimes infuriating. No matter how much I loved The Witcher 2: Assassin of Kings, nothing could be more annoying than not being able to walk straight down a hill with a tiny drop, you were blocked by an invisible wall. You had to walk all the way around. It’s a little annoyance, but still something I can’t wait to be gone. This time there is a huge, true open world in which you can traverse the world however you want. There are multiple paths or ways to get to your objective as opposed to one route. The Witcher 2 essentially had paths leading wherever you needed to go, and you could rarely deviate from them. Being able to explore the stunning world of The Witcher will be a privilege. Monster Hunts look fantastic. Like previous games you need to learn more about the monsters you’re going to be facing, but this time it seems more in depth. You need to find out what they monster is, and the motivation for what it is doing. Watching the griffin hunt was fantastic. Geralt heightening his senses so he could follow the trail of blood, before getting distracted by helping a merchant in need, and then going after the monster. A glorious cut scene of the monsters final moments then occur, and boom. The griffin’s head on Geralt’s horse. Plus, that’s amazing. Who wouldn’t want to carry the head of a bested monster as a trophy on their horse? Although the first two Witcher games were fantastic, there was a lack of permanent characters from the books. Every now and then you’ll hear from an old friend of Geralt’s, but there are very few who are involved for most of the games, these are mainly just Triss and Dandelion. However, in the next game Yennefer of Vengerberg and Ciri will play large parts, and this is brilliant. Those two are very large characters from within the series and it feels as if the games are heading back to their book roots by including these two. Yennefer has a complicated, yet deep love for Geralt, and he also reciprocates them feelings. Ciri is arguably the main character of the books along side Geralt, and she is known as The Lion Cub of Cintra. She is almost like a daughter for Geralt, and she looks up to him as a mentor, as well as father in The Last Wish. She is also a playable character in The Wild Hunt for some missions. The past Witcher games didn’t disappoint, and The Witcher 2: Assassin of Kings corrected many errors from the first, and you can be sure that The Wild Hunt will remove any last annoyances from the previous two. With two such brilliant games though, the pedigree for the next Witcher game is clearly there. CD Projekt Red will learn from any mistakes and create the best Witcher game yet. N0t only do they have two previous games to draw inspiration from, they have many brilliant short stories and novels which they can use for inspiration. All of the lore from previous books can be used to help create the best Witcher game yet. As this is the last installment for the series you can be sure that CD Projekt Red will want to go out with a bang. They have everything they need, and the proof is in the last two games that they can create the best Witcher game yet. Previous articleIs Anyone Really Looking Forward to The Order: 1886? Next articleUncharted 4: A Thief’s End – Who is Sam?